After my interview with Robby Takac of the Goo Goo Dolls, he mentioned to me that his record label Good Charamel Records, has a signed artist that will also be in Chicago soon. He introduced me to an all-female band from Osaka, Shonen Knife, mentioning “Shonen Knife is one of the hardest working, passionate bands I’ve ever known, I’m very proud to be part of their legacy here in the US.” The band was formed in 1981 by sisters Naoko (lead vocals/guitar) and Atsuko Yamono. Singer Michie Nakatani joined, and they released their first album “Burning Farm.” Atsuko and Nakatani left the band eventually, and Eimi Morimoto replaced them. 10 years after founding the band and gaining international recognition, the band was approached by a man who asked if they would open for his band. While the girls had no idea who the man was, you might – his name is Kurt Cobain, and the Shonen Knife joined Nirvana on a UK tour. Shonen Knife has recently released Overdrive, their 20th full-length album. Overdrive offers 10 tracks that seamlessly combine punk rock’s edgy guitar riffs with psychedelic 70s-esque enchanting nostalgia. The songs are simple, at times whimsical, and perhaps their best album to date. ‘Dance to the Rock’ is my favorite song on the album – the lyrics are simple enough to have you singing along before the song is even finished and the sound forced me to stand up and move. ‘Green Tea’ is bass-heavy, lyrical and most reminiscent of The Ramones, who the band credits with influencing much of their music. Despite its name, “Bad Luck Song” is sunny and uplifting. This album, though full of gritty hard rock, contains the same elements Shonen Knife fans have grown to appreciate and be amused by – particularly in mentions of Naoko’s daily life: shopping, noodles, green tea ice cream, dancing, cats and fortune cookies. Naoko, now a youthful 53, spent some time with me for an interview, in advance of their show September 18th at Bottom Lounge. LRK: What was it like being one of the first all-female bands from Osaka? Were there things hard to overcome, because of that? Or do you feel people were more excited/interested BECAUSE of that? Naoko: I didn’t have any conscious(ness) about that. I just wanted to form a band with people who have been my friends before. I’m shy and I didn’t want to start band with strangers. As a result, I formed an all – female band. LRK: What does the name Shonen Knife refer to? Naoko: “Shonen Knife” is an old brand name of a pencil knife. When I saw this knife, I was impressed by the name. Shonen means Boy in Japanese. The image of the words Boy = cute, Knife = dangerous. When cute and dangerous are combined together, it’s the image of our music. LRK: That’s funny. I’d read that it referred to a knife, but wasn’t sure if that was true! Your music covers quite the range, from pop, to grunge, to 60s…what made you focus Overdrive more on the 70s for inspiration? Naoko: I recently (have started to) like to listen to 70’s rock music like Thin Lizzy, Black Sabbath, Judas Priest, Deep Purple…I’m inspired by them. Our previous albums, “Free Time” is a punk album, “Pop Tune” is a pop album. And now it’s time for 70’s rock. LRK: I did catch riffs that reminded me of Thin Lizzy and Black Sabbath. How did the name “Overdrive” come to be? Naoko: It’s a name of a guitar effect pedal. It’s the image of 70’s rock sound for me. LRK: You put quite the emphasis on food, in your songs, in your blog…what started that? Naoko: Japanese people like food and create many ways of cooking. People in Osaka especially, love to eat delicious food. There are tons of delicious, reasonable restaurants streets in Osaka. I hope you can visit. I also don’t want to write about love because it’s too common for lyrics. LRK: I hope I can visit too! A trip to Osaka is definitely on my bucket list. Next month you’ll be visiting me, here in Chicago. What do you like most about Chicago? What do you like to do when you are here? Naoko: There is tasty pizza, popcorn and tall buildings in Chicago. I love that. Also Chicago and Osaka are sister cities. I like to eat delicious food in Chicago. LRK: As do I! Where are all the band members currently based? Naoko: The bassist Ritsuko and I are living in Osaka. The drummer Emi is living in Hyogo Prefecture where is next to Osaka Pref. All of us are living in Kansai area. LRK: What is your creative process like? you all write the songs together or do you work separately and then bring ideas back to the group? Naoko: I don’t listen to certain music for inspiration. I just listen to my favorite music at the time. I’m lazy and I can’t keep writing songs during my daily life. I usually start writing songs after we book the recording studios. I pick up a topic and expand it for lyrics size. I put melody line on it playing the guitar. Then I fix the lyrics for going well with music. LRK: After 33 years, I would hardly see you as lazy! What has changed for you all as you’ve gotten older? How has touring changed? Naoko: I got used to touring. I got to know how to get delicious food. LRK: (laughing) How has your subject matter for songs changed? Naoko: Nothing is changed but English lyrics are increasing. LRK: Was it easier earlier on or now? Naoko: Writing lyrics is always very difficult for me. Making music is easy, though. LRK: What are the main differences/challenges/excitements between touring in America and back home? N: Using English or my native language Japanese. Foods are different. Start time of the show is different. In Japan, usually shows start from 7:00p.m. In America, it’s midnight. We don’t have long tours in Japan. We play on weekends. LRK: As I get older, I find myself wishing bands would start their sets at 7 pm. I’m liking Japan more and more! What bands are YOU all listening to these days? 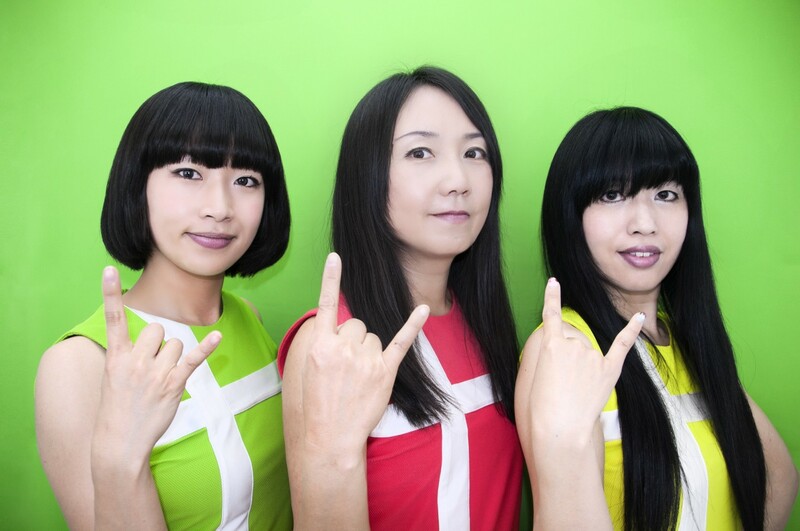 LRK: After this tour, what is next for Shonen Knife? Naoko: We’ll play in India. It will be our first time to go there and we are very excited. LRK: India – another place on my bucket list. What can fans coming to your show in Chicago expect to see? Naoko: Our purpose is to play music that makes people happy. We’d like to play enjoyable, fun shows. Wearing our new costumes, we’ll play some songs from our new album “Overdrive” and also from our best hits. Let’s have fun! LRK: Your music definitely does make me happy! Your lyrics are fun and easy to sing along to. I am looking forward to having fun with your show at the Bottom Lounge!